The war in Afghanistan is the longest war in US history. Now in its 16th year (and third US President), one might expect the war to be winding down; however, with a resurgent Taliban, and ISIS allegedly present in the country as well, President Trump has recently delegated authority over prosecution of the war to the Pentagon. Now, additional US and NATO troops are being deployed to Afghanistan, and Secretary of Defense James Mattis (together with National Security Advisor HR McMaster) is developing a new, more aggressive strategy for the war. In short, there is no end in sight. 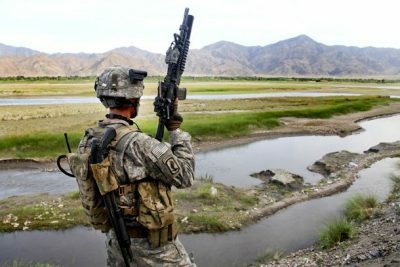 Although other wars have claimed this title in the past, Afghanistan is referred to by many as ‘the forgotten war.’ Even though it has been responsible for the deaths of thousands of US troops and many more people from Afghanistan, it sits nowhere near the forefront of public consciousness; it is more a vague blob in the public’s peripheral vision. Nine years ago, in July 2008, PBS aired a video report from their correspondent embedded with US troops in Afghanistan. Even then, at a time before George W Bush had vacated the Oval Office, the title of the video was “Afghanistan: The Forgotten War“. Then, eight years later at the height of 2016 presidential race, the LA Times published an editorial called “Afghanistan: The campaign’s forgotten war“, in which the author points out that neither Hillary Clinton nor Donald Trump even bothered to mention Afghanistan in their convention speeches. Trump was critical of US military interventionism during his campaign however, and even before his bid for the presidency began, he was in the habit of taking to Twitter to lambast the Obama administration for perpetuating the war in Afghanistan. But that did not stop Obama – who promised to end the war by 2014 – from leaving the White House in January 2017 with 8,400 US troops still stationed in Afghanistan. It is also not stopping Trump himself from reversing course and presiding over the next escalation of US involvement in the country. With the Taliban now in control of more territory than it has been since the US first went into Afghanistan in 2001, and the supposed appearance of ISIS in the country, one has to wonder what the last 16 years have really been about. There is serious doubt among informed observers as to whether an additional few thousand troops will make any difference. After the number 4,000 had been suggested, General Jack Keane, former vice chief-of-staff of the US Army, suggested that between 10,000 and 20,000 additional troops were needed to make a difference. Similarly, in the past few days, former CIA director and defense secretary Leon Panetta also weighed in, echoing Keane’s opinion that 4,000 troops would not change the momentum. As Danny Sjursen (the author of the article below) points out, the upcoming ‘surge’ in troop levels would be the fourth such move made by the US, following three similar increases by Bush and Obama in the years 2008-2010. It is beginning to look like escalating (or, in the case of Bush, starting) war in Afghanistan is something of a rite of passage for new presidents, as all three commanders-in-chief who have presided over the war have done so within the first year of their first terms. The question is, what is the US government actually trying to achieve, and is ‘winning’ even possible? Remember how the mainstream media treated the surge orchestrated by General David Petraeus in Iraq in 2007. The idea of the surge was received with fawning adoration throughout the media, and even by President Bush, who played his part in helping to advertise and hype up the strategy. And afterwards Petraeus had no problem taking all the credit for his ‘success’. Now replace the word ‘Iraq’ with ‘Afghanistan’. If that is even partly the case, the West requires a theater of war containing a long, infinitely extendable conflict in order to fulfill these requirements for the wider military-industrial complex. In Afghanistan, that’s exactly what they have. In Porter’s view, American objectives and methods in ousting the Taliban may have been short-sighted, as the Taliban came to power partly as a response to the sexual violence and predatory behaviour of Afghan ‘warlords’. Ever since the invasion in 2001, the US has played favorites with the warlords, pitting various leaders against one another; helping selected ones to become more powerful, allowing some to become regional governors, putting others on the CIA payroll, and eventually turning their private militias into the national police. Over the years several different US commanders have taken the reins of the war in Afghanistan, but this strategy of using the warlord militias persisted, since there was no other adequate source of manpower to provide security, not only for the general population in Afghanistan but also for the US-NATO coalition troops themselves. Although the frequency of green-on-blue attacks has declined (corresponding with the reduced US presence in Afghanistan), the number of different groups and interests represented on the ground make for an exceedingly complex web of relationships in which it is not always easy to see an attack coming. These criticisms may sound harsh to those hoping that the coming surge will make a difference, but the problems (and questions) regarding America’s involvement in Afghanistan are far deeper and broader than those presented above. John Sopko, the Special Inspector General for Afghanistan Reconstruction (SIGAR), makes quarterly reports to Congress about his oversight of spending on reconstruction in Afghanistan. Some of SIGAR’s findings over the years have been breathtaking. Take for example SIGAR’s finding that there may be 200,000 “ghost soldiers“, Afghan soldiers whose salaries are US-taxpayer funded but who seem not even to exist except on paper. Or the gas station that cost an absurd $43 million to build, but that nobody uses and about which the Pentagon now has no knowledge. Or the $28 million needlessly spent on uniforms for the Afghan army, in ‘forest’ camouflage, even though woodland covers only 2.1% of Afghan territory. Bear in mind that SIGAR only covers reconstruction costs, not appropriations for bombs, arms, planes or other military equipment, vehicles or weaponry. Since the US military first invaded Afghanistan in 2001, production of opium in the country has increased dramatically. Although it is impossible to measure exactly how much opium is being produced, the UN produces yearly reports in which it estimates production levels, as well as how much land area is allocated for purpose of growing opium poppies. The latest UN figures for the year 2015-2016 show a significant increase in both the area used for opium cultivation (from 183,00 to 201,000 hectares, a 10% increase), as well as for potential production of opium (from 3,300 tons to 4,800 tons, a 43% increase). In addition, despite $8.5 billion spent on eradication, the area destroyed by eradication efforts decreased by 91% from 2015 to 2016 (from 3,760 hectares eradicated down to just 355 hectares eradicated), and yield increased by 30% (from 18.3 kg of opium produced per hectare to 23.8 kg). All this places 2016 into the top three years for opium cultivation since the UN Office on Drugs and Crime began monitoring opium in Afghanistan in 1994. Afghanistan is the world’s largest opium producer by a very wide margin, with a widely cited statistic being that opium from Afghanistan is in 90% of the heroin produced worldwide. America’s War on Drugs is rife with contradictions, but the fact that US troops (and DEA agents) have been stationed in a country responsible for 90% of the world’s heroin market for 16 years, with production increasing and eradication declining, is, shall we say, counter-intuitive – especially when one considers that at home, media outlets across the country are reporting daily on America’s heroin and opioid ‘epidemic‘. According to the CDC, deaths due to opioid overdose in the United States increased by 16% between 2014 and 2015. Between 2002 and 2013, deaths due to heroin overdose nearly quadrupled. (Opioids are a class of drug that includes opiates – natural, opium-derived drugs like morphine – as well as synthetic versions like oxycodone or fentanyl; both are lethal and rapidly-growing problems in the United States.) Of course this is to say nothing about the legions of people languishing in US prisons for the nonviolent crime of drug possession. To assume that there is no connection between the country that helps supply 90% of the world’s heroin on the one hand, and an explosion in America of heroin-related addiction and death on the other, is foolhardy to say the least. “we provide them [poppy farmers] security, we’re providing them resources”. There are certainly questions that the US government has to answer about its relationship with the drug business. But another aspect of Afghan opium production which deserves further investigation is the extent of Chinese involvement in the modern opium trade coming out of Afghanistan. It has been reported that Afghan poppy farmers have begun growing what they call ‘Chinese seed‘, a genetically-modified poppy seed that allow farmers to grow poppies year-round and harvest their crops every two months. In March of this year, CNBC reported that ‘Chinese seed’ was in fact being grown legally in China for pharmaceutical purposes but had somehow crossed the border into Afghanistan. Last month 21WIRE featured the documentary Afghan Overdose, about the Afghan opium trade, in our Sunday Screening series. To understand how globalist empire-builders view Afghanistan, however, we might direct readers’ attention to a superb video by James Corbett for Global Research’s GRTV. In the video, Corbett explains in a very concise fashion the greater historical and geopolitical context out of which the current conflict in Afghanistan arose. The video provides evidence as to why 9/11 could not have been the real reason for the US invasion of Afghanistan, and what makes the country an extremely important asset in geopolitical and geostrategic terms. Afghanistan’s position as the world’s preeminent producer of opium alone would make the country very significant on the world stage; according to UN figures from 2010, the market for opiates worldwide is worth $65 billion, although the actual figure today could be considerably higher. Another very important factor making Afghanistan an attractive economic prize is what lies under the ground in the country; in addition to a significant amount of oil and gas, Afghanistan is also home to a vast wealth of minerals such as iron, copper, cobalt, gold and lithium, estimated at over $1 trillion in value. Let’s also not forget its appeal as the potential location for energy pipelines. As Corbett explains, however, the real value of Afghanistan is its strategic location. Drawing on the geostrategic treatises of Halford Mackinder and Zbigniew Brzezinski, Corbett places Afghanistan at the very center of the new Great Game, the battle between east and west for the crucial region of Central Asia, and ultimately the globe. The United States has not lived up to what the media tells us it is for some time. The war in Afghanistan is no exception.